Summary (from front of book): It is the winter of 1143 and all is not well in the court of Owain, King of Gwynedd in North Wales. 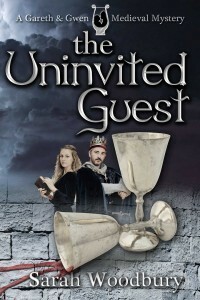 His future in-laws are untrustworthy, the Norman lords on his eastern border are restless, and among his wedding guests lurks a cold-blooded killer. Gareth and Gwen have marriage plans of their own, but their love will have to wait while the pair race to separate truth from lies, friends from foes, and unravel the mystery before King Owain—and his new bride—fall victim to their uninvited guest. 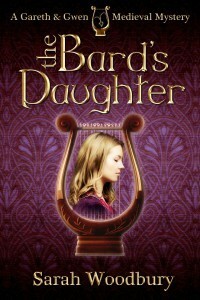 I enjoyed this book; not as much as the first book in the series, but still it was good. The main attraction of this series is the characters - I love Gwen and Gareth and Hywel - and the stories in both this and the first book were quite interesting and exciting, although they tend to be more adventure-type stories than mysteries - lots of time spent trying to chase and/or get away from the bad guys rather than following clues and trying to deduce the culprit (although there is some of that too, but the mysteries mostly seem to get solved mainly by accident). Another issue I had with this book, probably more than with the first, is with the writing - the dialogue sometimes feels a bit too modern and it is a bit awkward in places. I'm also not sure about how quickly Gwen is accepted as a detective by most of the people around her - I'm not sure most people in the Middle Ages would have been happy about a woman doing that sort of thing. But on the other hand, I do really enjoy this series and just try not to let those things bother me, because it is worth it for all the good bits. I'm definitely planning to continue with the series, although I have so many books to read currently that I'm not sure when I'll actually get round to reading the next one. Summary: When Gwen's father is accused of murder, she can't believe that he is guilty. But since all the evidence seems to point to him, everyone else seems to take it for granted that he was the murderer, and so it is up to Gwen to prove his innocence by finding the true culprit, before time runs out. Despite its short length, I think I enjoyed this book more than either of the two books I have read in the main series, although I did miss Gareth and Hywel being in it. But this book seemed to focus more on the actual mystery than the other two books, which was nice, and I liked Gwen's story and her development throughout the book - it was nice to get to know her better. I feel like this would probably be better read before the main series, although it was written later than the first two books - not that reading the other books first diminished my enjoyment of this one, but I felt when reading The Good Knight that I was missing some things which had happened previously which were talked about but not fully developed. It certainly isn't necessary to read this first, but I would recommend doing so.